What's better than one Westie? A pair of them! 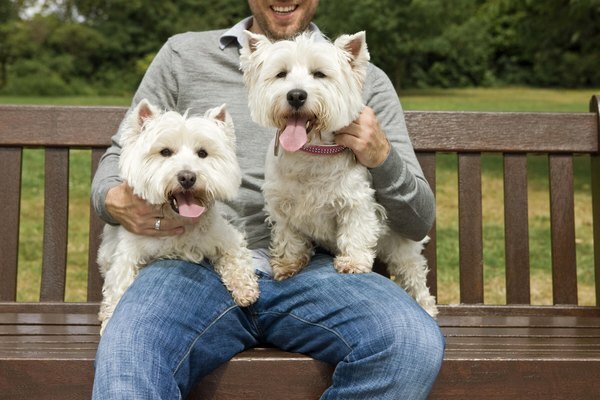 West Highland white terriers, affectionately known as Westies, are sweet, jovial little dogs. They virtually ooze personality, making them a popular choice with terrier enthusiasts and general dog owners alike. From television shows to dog food containers, the popularity of the West Highland white terrier is evident. Westies weren’t always the snow white jokers we know today. The earliest traces of this cheerful little dog can be traced back to the time of King James I of England. Westies were often presented to visiting royalty as a sign of respect, and sandy, tan-colored dogs were favored over pure white pooches. George Campbell, chief of the Campbell clan of Scotland, sought to preserve little white terriers in his region, and formed a breeding program to establish a solid, uniform type of terrier. It wasn’t until 1909 that the breed officially gained the moniker of West Highland white terrier. Westies are more than cheerful lap dogs; they are dyed-in-the-wool hunters. The dog’s short legs and long bodies make them perfect for going to ground, or chasing their prey into a den. These vocal little dogs often bark to call in the cavalry when they’ve trapped an unsuspecting critter. Westies are prey-driven little pooches and will happily flush out and catch rodents in even the darkest corners of your property. Work isn’t the only thing Westies are good at; they’re excellent companions and show ring partners. These little terriers are just as happy to stay home and fill your lap with love and attention as they are to compete in a host of events. Westies are very intelligent and excel in the obedience ring. The breed’s short stature and endurance allow them to compete in agility with the big dogs. Westies are also popular in the conformation ring, with Westies taking top honors at both the Westminster Kennel Club dog show and Crufts. The undeniable charm of this breed has made them a hit in popular culture. The Juicy Couture company logo features two Westies holding a shield, while the Black and White Whiskey company’s bottles highlight a Scottish Terrier and a Westie. The “spokesdog” of the dog food company Cesar is a West Highland white terrier, who appears on labels and in television commercials. Even Doggie, the playful pooch owned by Kahn on the hit animated program “King of the Hill” is a Westie. What Does a West Highland Terrier Look Like? What Kind of Dog Is on the Cesar Puppy Food Commercial?